Haitian women packed Eglise Apostolique de Fond Fable Church to hear ministry leaders shed light on cultural myths about women's lack of value versus what the Bible says about God's unconditional love. Marie Saint Germain was desperate. She had been living with the father of her four children, Samuel, for 16 years, but they fought constantly. After losing their home in the Haiti earthquake of 2010, the family of six now shared a single room—which didn’t make matters easier. Some nights she was afraid to go home and face him. Marie Denise Saint Germain has found new life and peace with her husband since attending a church that teaches about gender-based violence prevention. During Marie’s search for help, she found Pastor Nocent. “He listened to me and was always in prayer for me and my family, though I was not a Christian,” she said. Pastor Nocent has spent a great deal of time counseling on marital problems and domestic violence because so many of his congregants have struggled with these issues. This is not unusual for churches in Haiti, especially since the 2010 earthquake destroyed or crippled thousands of lives. Harmful cultural myths about women are widely accepted, such as women are like wood that can be easily repaired if damaged, women are like rats, and women are like cows that aren’t worth as much after they’ve given birth. Due to widespread belief in these myths, severe marital disputes and violence against women often go unchallenged. 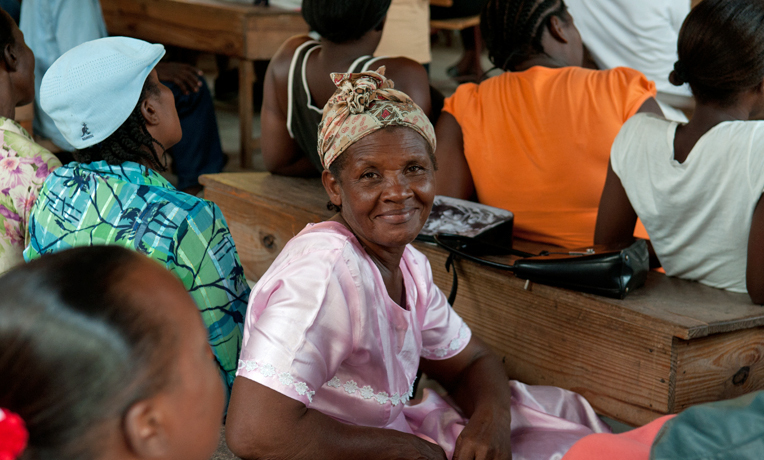 Last year, Samaritan’s Purse offered to help train Pastor Nocent through our gender-based violence prevention program. Our program mobilizes local churches and organizes trainings to teach pastors and ministry leaders how to understand and articulate the issue of violence against women, how to confront the problem, and how to counsel men and women involved. The training enables participants to re-examine existing myths that leave women and girls vulnerable and explore the concepts of biblical manhood and womanhood. Our goal is not only to prevent more occurrences of abuse but also to preach the Gospel of Jesus Christ so that lives will be changed. After participating in the training, many men and women chose to get baptized. After Pastor Nocent received the trainings, he began to incorporate the topics into his sermons. The response was more than he expected. “Many people, including me, came to the church to learn these new concepts,” Marie said. When the congregants started to see how God made both man and woman in His image and to understand marriage in light of the Gospel, restoration occurred. Church attendance grew dramatically. Many who had never accepted Christ repented of their old lives and placed their faith in Him. 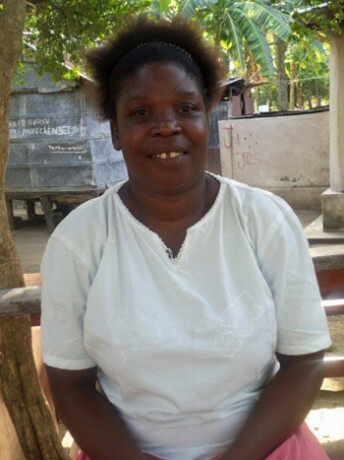 Marie eagerly accepted Jesus as her Savior and asked Samuel if he would attend church with her. He agreed, and when he heard the Gospel, Samuel gave his life to Christ as well. The couple’s four children followed suit, and their family began a transformation. In January, Marie and Samuel reached another milestone in their relationship. They got married. 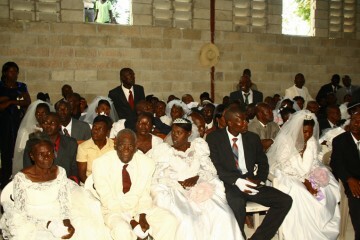 Pastor Nocent officiated a wedding for men and women who had been living together and who wanted to make a commitment. Their marriage was part of a collective wedding ceremony that Pastor Nocent officiated for more than 30 couples that had been living together and wanted to rededicate their relationships to God before the church. Ten of these couples had recently committed their lives to Christ for the first time. “When I learned the importance of couples to put Jesus at the center of it all, we decided, like many other couples, to be baptized and to be wed in church with many witnesses,” Marie said. 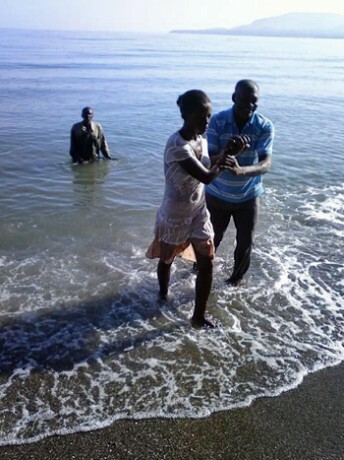 Pastor Nocent’s congregation continues to grow spiritually and numerically as Haitians embrace biblical truth and learn about the Lord’s love for His bride, the church. The Samaritan’s Purse trainings have also helped infuse new life into the pastor’s role, as he is able to dedicate more time to evangelism and church activities, rather than only resolving marital issues. Marie found that the solution she had been looking for all along was Christ.